Posted by Jon in NECA, Review, Video Games with 3 comments. There’s no better time to hop on a video game franchise than the fourth entry, right? Having never owned a Playstation 3 put me at the disadvantage of not experiencing a bunch of the long-standing Sony franchises like ‘Uncharted‘ or ‘God of War.‘ Last year, I finally purchased a PS4 and am slowly catching up on these things I previously missed out on. I still haven’t tried God of War, I want to, but I think I’m also just going to hop in on the new one coming this year. It seems different enough that I probably don’t need to know what happened in the previous entries. This release leaves me wondering if NECA has more in the pipe for the new God of War game? By NECA’s standards, the release is fairly basic as far as accessories go: an axe, shield, and knife. The good news about this load out is that he can carry all of his accessories on his person! The bad news is I want more. Mostly, I’d like a screaming face sculpt for Kratos, but I could also use some alternate hands. Kratos seems like a great candidate for an ‘Ultimate‘ treatment. Kratos is meant to hold is accessories in a very specific way. His right hand is open, and the left is a fist. I made an interesting discovery while messing around with his articulation. The figure looks to be made out of the normal materials that NECA uses for all of their figures, but the wrist joint is much sturdier ABS plastic which you often find on imports. I was curious if this meant that he had given him the ability to swap hands. I’ve tugged on them a good amount, but they don’t appear to want to come off. Maybe he’s just built this way as a consideration for a possible future release. His axe splits in half, allowing you to easily slide it in and out of his hands and the clip on his back. Kratos also has a sheath on the left side of his belt for the knife. Sadly, the horn on his belt isn’t removable. REGARDING THE SHIELD: There are no instructions included with the figure, so you may be scratching your head as to how he holds the shield. I sure was! The solution is that the second silver panel closest to the elbow on his arm-guard is removable, exposing a slot that is shaped to accommodate the knob on the middle of his shield. It’s a neat little solution that is not very obvious if you aren’t shown going into it. As far as articulation goes, Kratos has a solid scheme that is pretty great for posing. Double-elbows and double-knees really help him get into some good combat positions. The range of his neck ball-joint is fantastic and the beard is sculpted to leave a decent amount of clearance. An ab crunch would have been nice, however, he has another ball-joint where the torso meets the hip and it also has a decent range of motion. 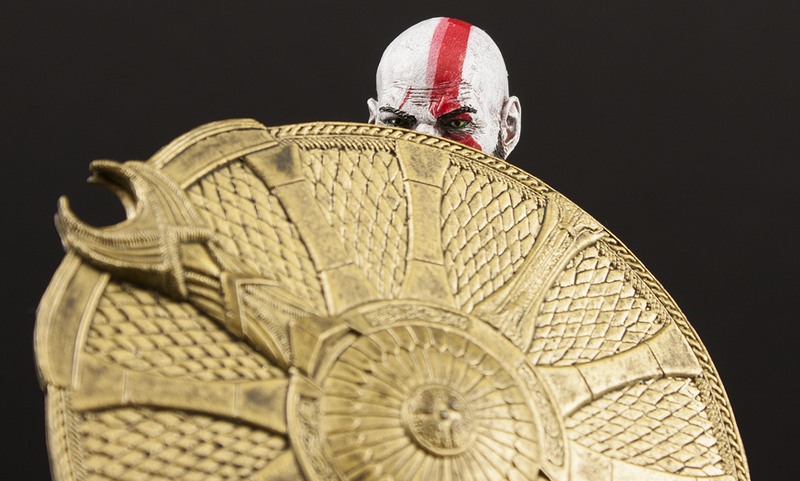 Would I recommend NECA’s God of War 2018 Kratos? I was really happy with how this figure turned out! It was one of those sneaky releases that did not hit my radar until it was already available in stores. Kratos has a lot of mass, is built tough, and the paint looks great. If you are a fan of the franchise or just looking forward to the new game, he’s definitely worth checking out. Really, the only problem I have with this figure is that I want more! A screaming head would have been so awesome. Here’s hoping there will be more God of War stuff announced at Toy Fair in February. If you need some mooks for Kratos to fight, I’d suggest grabbing a few Mythic Legions figures if you can get them a decent price. Kratos is currently available to purchase on Amazon. Just bought this figure last week and finally got around to opening him. Great figure! The joints moved well right out of package and the poseability is almost perfect. I think the best articulation point I like is the head. You would think with the beard that his head couldn’t move that much but it has great range. A+ figure, especially for the price. Awesome! Glad you enjoy him, he’s a pretty great figure with great shelf presence! I just got this figure yesterday and I love it! For the past couple of years I haven’t bought any NECA products due to Q.C. issues. After reading some reviews, watching a few youtube vid’s, I decided to give this figure a chance and I’m glad I did. It has a great range of motion, detailed sculpting, great paint apps, and sturdy construction, if NECA maintains this level of quality moving forward I’ll be back for more. I really hope they make a figure of his son Atreus and a ultimate version with more accessories and maybe some epic armor!